At its Annual General Meeting on Monday 10 June 2013, Down District Council elected Councillor Maria McCarthy (SDLP) as Chairman and Councillor Gareth Sharvin (SDLP) as Vice-Chairman. Councillor McCarthy, a member of the SDLP Party, was co-opted to Council in 2009 and is serving her first term as Chairman of Council. 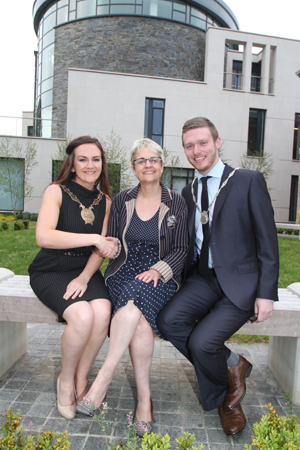 She succeeds Councillor Mickey Coogan as Down District’s First Citizen. 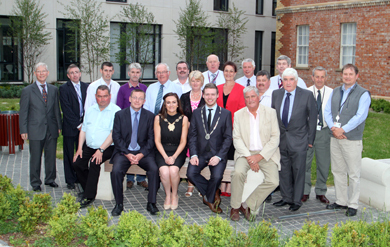 Down District Council councillors pictured at their annual general meeting in the Downshire Civic Centre. Speaking after receiving the chain of office, Councillor McCarthy said: “I am privileged to be nominated by my party as Chairman of Down District Council. This is the district in which I was born, grew up, work and live in and love. I am proud of our district and proud to be the First Citizen. I give a commitment to and look forward to, representing the entire community, and to be inclusive of the various groups and bodies from around our area in the year ahead. Speaking about the year ahead, Councillor McCarthy said: “This is an extremely important year to chair the Council with the Review of Public Administration taking effect, an election proposed for next year and crucially during a difficult economic climate for our people. “It will be my aspiration to ensure the work of the Council is carried out in an efficient business manner. I will be working with my colleagues, and look forward to their co-operation to ensure the highest standard of public service balanced with the best value for money with local rates. “The Down District area has incredible tourism potential from the shores of Strangford Lough to St Patrick’s Country to the grandeur of the Mourne Mountains. The Council already have considerable tourism initiatives and in my year ahead I want to boost the image and profile of our district as a place to holiday and do business. Tourism is our sleeping giant, and I intend to maximize it’s full potential. South Down MP Margaret Ritchie congratulates new Down District Council Chairperson Councillor Maria McCarthy and Councillor Gareth Sharvin, Vice Chair, on their new offices. In paying tribute to Councillor Coogan, the outgoing chairman, and Councillor McCarthy acknowledged his “successful year” and praised him for “working tirelessly for the district”. SDLP Councillor, Gareth Sharvin, who was elected Vice-Chairman, will support Councillor McCarthy in carrying out the official engagements and duties during her term in office. Councillor Sharvin said: “It is a great honour to be nominated and selected to be your Vice-Chairman for the people of Down District. “It has been a rollercoaster of 16 months from when I took the council seat. I have progressed from being a grassroot member to a councillor to the Vice-Chairman of Recreation and Community Services and now to the Vice-Chairman of Down District Council tonight. I would like to thank so many for helping me to get where I am today, especially Eddie McGrady, former MP, and the late Peter Craig, for providing their guidance and giving me many wise words. “My year as Vice-Chairman will aim to deliver for the youth, the elderly, for the families across our district and our local businesses. I want to see more for the youth in our district. To deliver a scheme of events throughout the year which will offer our youth a community spirit and the essential skills they need in today’s society. The outgoing chairperson Councillor Mickey Coogan expressed his gratitude to the Vice Chairman and his colleagues for the support they had given him during his term in office. He also thanked the Chief Executive and Council officers for their guidance and professionalism throughout the year in delivering the Council’s services. Councillor Coogan said: “When I took over as chairman a year ago I really did not know what lay ahead of me. It has ben a tremendous year, a real rollercoaster. I have always worked for the interests of Down District at heart and there were good and not so good times throughout the year. For example, the flooding in Newcastle saw the Council put its emergency plans into effect and I was involved in executing these and helped clear roads and footpaths. “So many things were happening throughout the year involving community and voluntary groups and in schools. I was delighted to host several school council meetings in our chamber in the Downshire Civic Centre where our new offices were officially opened. “Toursim has also been a major activity throughout the area from the Festival of Flight, St Patrick’s festival, events at Castleward and Hallowtides to name but a few. We must continue to promote our area in the future. Soon the mountain bike trails will be officially opened in the Mournes, and we have other programmes such as the Ballynahinch Streetscape to look forward to in our urban renewal. Councillor Terry Andrews (Independent): “Outgoing Chair Councillor Mickey Coogan had a unique style as a councillor and spoke out on a raft of issues. I was delighted to see his work with young people in the chamber. He certainly opened doors for Down District Council”.